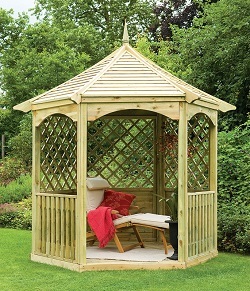 Our wide variety of gazebos provide the perfect shady place in the garden including a choice of treated timber, metal and fabric designs. All sourced from big brands including Grange Fencing, Zest4Leisure, Rowlinsons, Forest Garden, Norfolk Leisure and Glendale. Make one of our gazebos into an outdoor dining shelter and enjoy al fresco dining through the summer months or use one of the Glendale polycarbonate gazebos as a canopy for your garden lounge area on the patio or in the garden. Don't miss the best-selling Venice, Vintage, Seville and Roma BBQ gazebos.